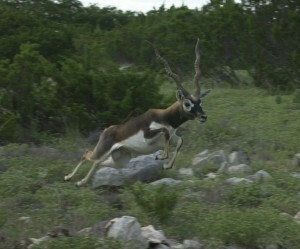 Considered to be the most exotic of the exotics, the Blackbuck is native to India and available to hunt year-round. Mature males are black and white in color with some brown on the back of the neck and also on the spine close to their tales. Younger males and females are light tan & white. Only males have horns, which cork-screw up and back. A large male will weigh around 100 pounds, and can run extremely fast.